For centuries the phrase "It's all Greek to me" has been used to express how difficult and incomprehensible the Greek language is. Greek is a difficult language, undoubtedly, but a significant part of its vocabulary lives within English and the other European languages. 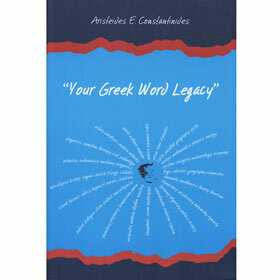 This work records 10.000 headwords adopted by English (with clear definition or correlated with English words of common use), most of which will be proved to be familiar and "not Greek to you at all". - the main characteristics of the historical names and the names of mythology that are used in English, such as mentor, nestor, Cassandra, circe, terpsichorean, hector, erinyes, laconic, croesus, ostracism, nemesis, rhadamanthine, Penelope, sibyllic, hermaphrodite, stentorian, solecism, etc. At the very least you will enrich your vocabulary.